In early 1999, after the Model C1 but before the D2 came this model. The SC-3--the device to the left--used to reflect the C2's transmission beam as well as transmitted the composite waveforms of the D2. Here are some more detailed pictures of the C2 device. My reading and understanding of the Model 'C' experiments led to the construction of the Model C2-137 Nonlinear Oscillator in March. The Model C2 was very similar in design to the C with enhancements to the magnetic coupling systems. It's operational behavior was this: a signal was input by an external generating device, such as a sine wave generator whose linearity was known. The signal was shaped by a series of inductors, resistors, and capacitors and projected into a set of two pairs of magnets. The internal pair were placed across a nonconductive plate of clear plastic and mounted with their fields attractive; the second pair were substantially larger than the inner set and mounted with their fields opposing. This caused a greater magnitude of vibration that the C had demonstrated; when photons were introduced into the core of the C2--the magnets were flat spheres with a defined hole in them--they absorbed the charge in the core and the device projected a beam of energy consisting of plasmons or charged particles unlike the assemblage of the ones first introduced to the core. The results was a projected beam of polarized light "sewn" with electron-positron pairs which created the plasmonic state that could be seen with the naked eye. The beam behaved similar to the laser that was the source of photons; the beam could not be necessarily seen from the side (unless the absorption rate of the e-p pairs were shifted by altering the frequency on the signal generator) but was clearly visible to a detector placed in the path of the beam. I achieved beam saturation at a frequency of 11.75GHz but discovered the C2 was prone to internal wear. 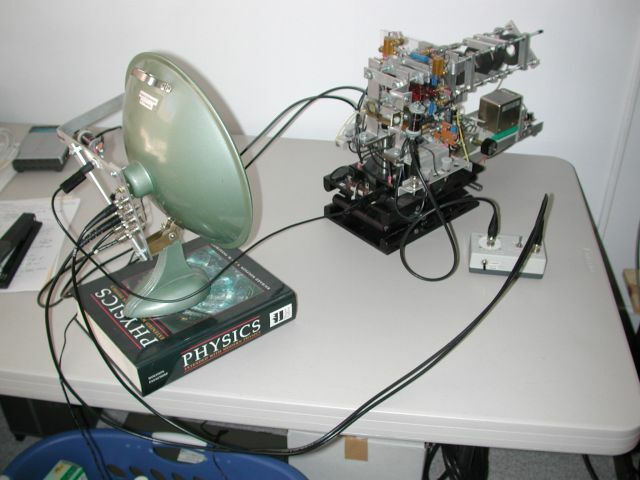 After a number of experiments, I had to raise the frequency and power of the external generator until the necessary saturation potential moved beyond the capabilities of the device. I conducted about 35 successful experiments with the Model C2-137 between May and November 1999 before it wore out entirely. The analysis of the data told me my thinking was exactly correct but there was a lot more than was unbeknownst to me about the nature of particles in the universe; many of the conclusions I reached then are still a mystery to me now. They need to be explored further but suffice to say it was a rather easy thing to strip an object, a particle, of its time vector and plunge it into a configuration not alien to it. But that reality of a particle can be easily changed if the time vector is removed from its propagation.